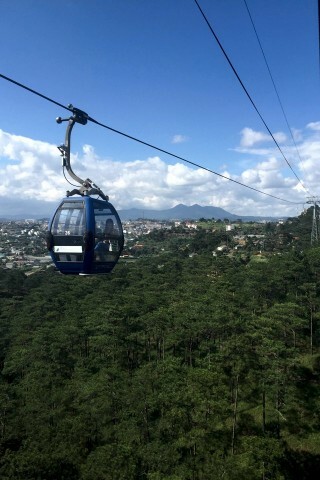 Float through pine forest and soar over Da Lat’s famed verdant hills on the city’s 2. 4-kilometre cable car. On a clear day you’ll be able to see farmland, greenhouses, lakes and distant mountains. The cable car connects Robin Hill, which has the usual cafe and souvenir shop, to Truc Lam Pagoda and Tuyen Lake – both are definitely worth the visit. Robin Hill is three kilometres south of Xuan Huong lake and should be a cheap, quick taxi ride. Given that a roundtrip ticket is only 20,000 VND more, it’s more economical to take the cable car to Truc Lam Pagoda and Tuyen Lake, have a walk around and take photos (allow for around half an hour) before riding back to the city. Or to knock off another site, do a one-way ride and from Truc Lam Pagoda, take a taxi to Datanla Waterfall which is three kilometres east.